The National Coursing Club (NCC) was formed in 1858 and has controlled greyhound coursing since then, in the same way that the Jockey Club controls racing. The latest edition of this classic record of the Greyhound Year, a Must for any greyhound breeder or owner! 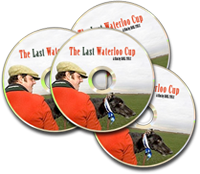 A must see documentary about the last ever Waterloo Cup, the "Blue Riband" of Coursing - run at Altcar near Liverpool in 2005 - by the award-winning director Paul Yule.